What does the reader want in a quilt pattern and how hard can it be and still be fun? This is what fills our heads when we write books. Neither of us approaches a book thinking “let’s just do a bunch of quilts we like.” There are so many factors to work around ranging from how many pages we want to dedicate to templates, how big the templates can be given the size of the pages and how we can fit as many different techniques and examples in the book and still have the collection look coherent. Right now it’s “all book, all the time” at FunQuilts. The first third of the book is due on Oct 1 and we need to finish up all of the quilts soon to get the styled photo shoots done in the next month or so. So it’s really difficult when you’re just not sure about a quilt that’s going in the book. Bill and I have spent the last few weeks agonizing, redesigning, cutting out circles, pinning them, insetting them and then having long discussions about YOU, the reader. I often wish I had a group of you sitting in the studio to give us input before the book comes out. When it comes to deciding what’s too hard for the average quilter and where the line is between challenging and frustrating we’re always trying to figure out where the sweet spot is. Then, every now and then, we get the feeling that people only want fast and easy quilts and that can be confusing too. B: I like the smaller radius. It’s more elegant. W: But I found it frustrating to inset circles that small. B: But it’s an advanced quilt. W: Advanced means you need to be an experienced sewer not that you should have to rip out tucks constantly even if you are a good sewer. If it’s hard for me shouldn’t we assume that it will be hard for them? I don’t want the reader to get frustrated. B: I don’t want them to get frustrated either. I think we want to challenge and inspire them but not frustrate them. OK. I’ll redesign the pattern. And so we start all over again. The reader sees the finished product but doesn’t see all of the prototypes and messed up blocks that led us to that pristine design that’s beautifully photographed in the book. Amazingly the quilts over which we fuss the most often end up being our favorites and Hole in One is no exception. Both of us love, love, love that quilt. Our publisher has asked us not to show any quilt in its entirety before the book is published but here’s a peek at part of it. I’m a huge fan of your book The Modern Quilt Workshop and one of the reasons why is that you included projects at a number of different skill levels. I can grow as a quilter with your book. I feel that the whole “quick quilt” marketing scheme doesn’t give quilters enough credit. Also, based on your work, it’s just not your niche. The people who are drawn to your work and, subsequently, your books, are quilters with a modern aesthetic and a willingness to experiment. Quilters are problem solvers. If that set in circle doesn’t work for them, they’ll redraft it larger or applique it. Stick to designs that inspire you and text that illuminates the creative process. We’ll follow your lead. Definitely both! Sometimes I want to make a fast quilt, and sometimes I want to try something different that may take longer. Hmmm, not very definitive, huh? Your book “The Modern Quilt” was my introduction to quilting and is probably how I got hooked on the craft, seeing another way to quilt, that it could be bold and have amazing color sense. 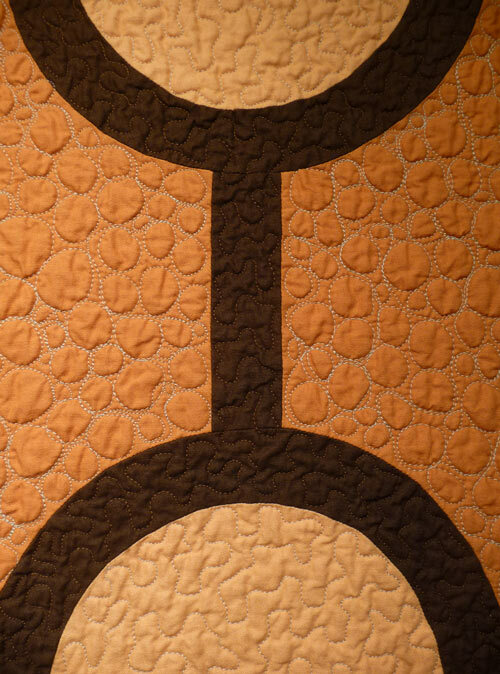 One thing I realized when I went to other quilt books, magazines and patterns is that I’d learned how to do things in your patterns–a log cabin, matching oblique angles like in “Boomerang”–and could look at a quilt and knew at least some of the techniques needed to reproduce it. I wasn’t learning only how to make this one pattern–I was learning what patterns were all about. Both! There are some times when I want to crank out product just so I can enjoy a particular fabric … and other times when I’m in the mood for process and learning. I adore your Modern Quilt Workshop book because you offer patterns for any mood I’m in. The combination of easy techniques vs. new-to-me techniques makes this a book that continues to provide inspiration even as I grow in my quilting skills. And while I’m talking about that book … I love how you include a variety of colorway illustrations. I think this helps me get a feel for the pattern itself, not just the pattern as rendered in a particular way. Thank you in advance for your next book — I can’t wait to see what new treasures you have in store for us! I have both your books, and I find I go back to them again and again for inspiration. They are more than about patterns, but technique and color sense. That’s what I really appreciate. A “quick quilts” book may get use, but I find that once I’ve made a pattern I don’t want to repeat. Your patterns really make me think about color and composition, while a straight up pattern book doesn’t usually do that in the same way. I feel like there are enough “standard” quilt books on the market. There is no need to fill the market with more of them when you and Bill have so much more to offer the quilting community. I will second what someone said about the different colorways–I find that very helpful, as it helps me be a little more creative than just making the one pictured in the book. I like both. I’m a newish quilter, so having accessible projects is important to me, but I really love reading about the process behind the more challenging quilts because it both gives me something to reach for and I might learn something I can apply to a simpler project until I’m ready for the challenge. As an aside, I grew up in Oak Park (River Forest, actually, but my husband and extended family are all from Oak Park). Also, my parents gave my son an elephant Many Hands Blankie the day he was born; it was the perfect match to his nursery and I felt as if it had been made for us. At that time, I knew nothing about quilting, but now that I’m learning and have stumbled on your blog, it’s even more fun to have that blankie! Can’t wait until the new book comes out! CHALLENGE ME!! I loved Modern Quilts so I’ll take a punt and order this as soon as it becomes available. Do funky and fresh and I’ll love you forever! I am very excited about your new book and can’t wait to get my hand on it because I love all of your works. I am a newbe in quilt world and I like to try every thing. So I like BOTH. I can’t wait to find out about your books and quilt site. Found this through reclaim your home! Thanks. I agree with many of the remarks that a mixture of quick and challenging is great. 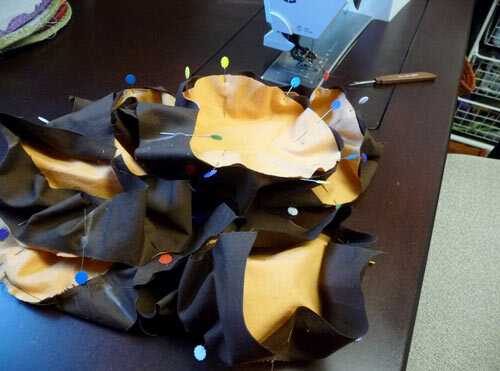 Sometimes you just want to do some fairly mindless sewing and crank something out. Other times, the quilt has to be just the right thing. Then, it doesn’t matter if it is hard or even occassionally frustrating. The creative, stretching process and the beautiful result make it all worthwhile. I also love the color options! Can[‘t wait to see the new book. I love a mix, like many others who have commented. Even if there are patterns in a book that are beyond my level I’m still interested to read about the different techniques and see something I can stride for. There’s nothing worse than a book that has a lot of patterns that are all so similar and don’t really challenge you to think of different colors, fabrics, techniques, etc. I can’t wait to see the new book! I would like to see both new designs and techniques as well as new takes on earlier designs. Your approach inspires me and it is obvious that much thought goes in to what you include. I read with interest your comment that you wish you had a group of quilters in your studio to give you input on your new books-in-production. Have you thought of having some sort of focus group to whom you would (for example) email your design ideas/patterns for feedback? I think most quilters want easy to mid-advanced. I like something that looks difficult but assembly is fairly easy. Sometimes we need something to be done and then as was stated above,sometimes we want to work a little. I read somewhere that the quilt industry leans toward fast and easy so we quilters will buy more fabric more often. I think most people buy what they like PERIOD. I love your design and color sense. Thanks for sharing with us! I just look for quilts I love, and will bring my skill level up to it (or at least try)! But for the Hole in One quilt: have you ever seen Dale Fleming’s six-minute circle technique? That might be something to at least point people to who don’t want to do painstaking set-in circles. I hope I see you in Houston this year! I don’t want just a bunch of patterns. Patterns are ok, but I want to be inspired. Not just to make the quilt htat you have already made, but ideas to make it my own. Similar to what you did in the color book with all the different color combinations. I also want great pictures and LOTS of them. More pictures than patterns, thanks. I have read with interest all the comments posted and recognize the talent and incredible insight of quilters who read this blog. With the Modern Quilt Workshop being a “first of it’s kind”, this second book will “wow our socks off”! There is no one else out there who is as willing to share your story, your beautiful free patterns and advice as Bill and Weeks. Congratulations and I’ll anxiously await an autographed copy! All of these articles have saved me a lot of haedeachs.